Can Snowmobiles Adapt in the Age of Ethanol? (PhysOrg.com) -- By 2022, federal regulations will require a 400 percent increase in the amount of renewable fuel in America’s gasoline, from 9 billion to 36 billion gallons. Cars and trucks are being designed to run on these ethanol-rich fuels. But can a snowmobile? For the owners of the 1.7 million snow machines registered in the US, it’s a serious question. Miers will begin to answer it this winter. He will test snowmobile emissions and fuel economy on E15 fuel, both in the lab and on the trail. 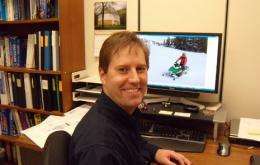 He will also study how well snowmobiles start at low temperatures on the higher-ethanol blend. “If you can’t start in the cold, you can’t snowmobile,” Miers noted. The research will be conducted in cooperation with the SAE Clean Snowmobile Challenge, hosted annually by Michigan Tech and set for March 15-20. The Clean Snowmobile Challenge is a collegiate design competition of the Society of Automotive Engineers. Engineering students from participating schools take a stock snowmobile and reengineer it to reduce emissions and noise while maintaining or boosting performance. In 2009, teams adapted their engines to run on flex-fuel, with varying ratios of ethanol and gasoline. The $69,000 project is funded in part by a $25,000 grant provided by the Bureau of Energy Systems, part of the Michigan Department of Energy, Labor and Economic Growth. Gage Products of Ferndale is providing fuel, and Yamaha is donating a snowmobile. Emissions testing equipment will be provided by the Clean Snowmobile Challenge.